Are you still hesitating to find a new kind of cake decoration material to decorate your cake? When you have baked and decorated, are you trying to innovate better patterns and colors? 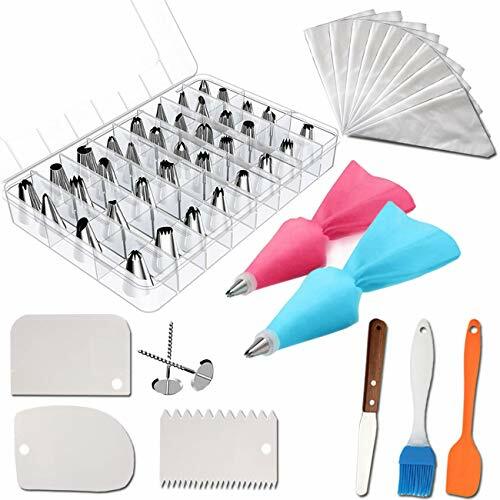 The MINDA cake decor kit not onlymeets the needs of an experienced baker, but also provides beginners witheverything they need to satisfy their cake decorating needs. All baking tools are made of high quality food grade materials. Cake decorating tools easy to clean and dish washer safe. Cake flower mouth compact, Lightweight and easy to use. Baking tools kit made of durable and high-quality materials, so their service life is as long as possible. Stainless steel cake tools meets all industry standards. Our cake flower tubes is corrosion resistant so they won't rust. Cake smoother tool for icing reusable and non-sticky. Cake decorating tools tip connector and housing are odorless and non-toxic. The perfect baking tools set to decorate all the cakes,cakes, cookies, pastries, etc. So why not put this decoration into your shopping cart? 【SAFE AND EASY TO USE】: The baking kit is easy for children and adults to use. High product quality and safety: The material is 100% safe, non-toxic, smooth and does not rust. 【COMPLETE TOOLS】: Includes 32 pipe nozzles, 2 pipe tip connector, 2 reusable bags, 2 Flower studs, 1 brush, 1 cream knife, 1 silicone spoon, 3 smoother scrapers, 1 Plastic storage box and 10 disposable bags. 【CAKE DECORATION PRODUCTS】: Our cake decoration products can help you make cakes of various shapes. You can use these easy-to-use tools to make Muffin cups, brownies, macarons, cookies and various cake decorations. 【CLEANABLE AND REUSABLE】: All tools can be cleaned and reused with water. Durable stainless steel and easy-to-use bags meet your daily needs. 【12-MONTH WARRANTY】: We provide 1-year warranty for MINDA Cake Decorating Kit. If you have any questions about the product, please contact us directly. If you have any questions about this product by MINDA, contact us by completing and submitting the form below. If you are looking for a specif part number, please include it with your message.